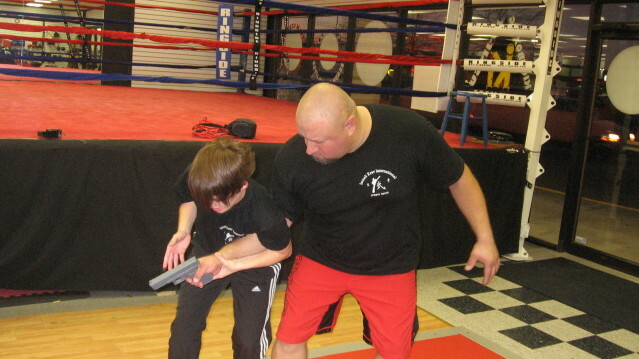 We try our best to train for the reality of violence in the world today. We are not Ninja or Samurai or Biblical warriors but simply people trying to survive in the world in which we live in. As such we always try to learn from real cases. There is a video making the rounds of a brave older man in a cowboy hat who confronted a young hoodlum in a grocery store. There is much we can learn from this case and much that validates what we have been teaching and preaching for years. 1. Options - Many non martial artist will say things such as, "Sure, but if the guy has gun the game is over. You can't do anything against a gun!. Truth: You can do something against a gun. You have to decide what is at stake, a few dollars, your life, your wife, the lives of your family. It is up to you to decide. Some urban dwellers are so fed up with crime that they will no longer tolerate these robberies. Even though "only" money is involved they choose to fight back. The moral of this case is you can fight back and defeat an armed robber. 2. Remain Calm - We advocate remaining calm, showing confidence and then moving to the defense. Other associations advocate acting, pretending you are terrified and then catching the gunman off-guard. While there may be cases where that approach will succeed it does require good acting skills. In this particular case the older gentleman with cowboy hat showed he was not afraid of the young punk and this worked. 3. Technique - While our hero certainly deserves the bravery award he used, perhaps unknowingly, a Krav Maga technique as taught by the Israeli Defense Forces. We dropped this technique years ago. The technique involves coming from behind the gunman, placing one arm around his neck and with the other arm grabbing the gun-hand. I have argued that this is not a strong enough move to control and stop the gunman. He will still be able to get off a few shots and he can still resist. Truth: This case demonstrates that even though the cowboy pulled off the technique correctly he did not succeed in controlling the gunman for long. By the grace of God no shots were fired and the market was quite empty. Attempting such a technique in a church full of worshippers could lead to a pre-mature meeting with God. In this case the gunman eventually broke lose. 4. Window of Opportunity/Distraction - We also stress that even when a situation looks hopeless it may not be. If you watch closely window of opportunity may open, but only for a spilt second. We also teach that even a minor distraction can cause the assailant to become distracted. Remember, he too is nervous and the slightest distraction could cause him to lose focus, this is your window of opportunity. Truth: In this case we see that as the cowboy remained calm there was some background activity going on. The gunman turned around, just for a moment, to see what was happening. The older gentleman in the cowboy hat used that moment to do the technique I mentioned earlier, grab the gunman from behind by the neck. 5. Team work - We teach that once one person acts hopefully others will join in and help. That is why we aim to create a nation of warriors. What we witnessed in this case was once the cowboy grabbed the gunman others joined in. The gunman was able to escape the hold but now was terrified. He ran right into the trap of one of the employees who knocked him down. At that point the cowboy assisted in subduing and controlling the punk. 6. Size - All styles preach that their techniques will work for people of all sizes but we do not believe this. We adapt the technique for the person. Truth: In this case the cowboy was a larger man while the punk with gun was quite skinny. Had it been the other way around there would have been no chance for even the temporary hold that was achieved. Change and Growth is Constant - New situations are constantly emerging. The world is in a process of constant change and so must we be. While human nature is sadly the same, new technologies and new methods of crime are emerging. With IKI we aim to keep up with the reality of crime so that all can live I peace. That is why our DVDs need to be updated every few years. Britt with her instructor the late great Gary Hodges Jr, doing the IKI technique correctly. Even a smaller person can pull this off. The technique the cowboy used would never have worked for someone the size of Britt against a broad shouldered man like Gary.